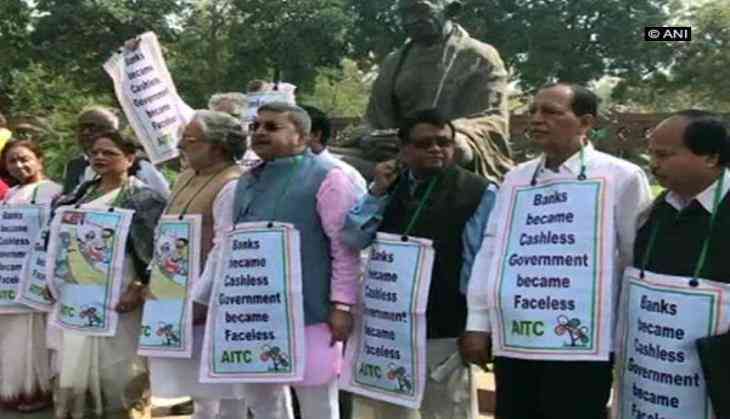 All India Trinamool Congress (TMC) MPs on Monday protested against Punjab National Bank (PNB) fraud case in front of the Gandhi statue in Parliament. Earlier in the day, TMC leader Derek O'Brien said his party is for a debate and a discussion in Parliament and would evolve a joint opposition strategy soon. "We will coordinate with other opposition parties to expose this BJP government that has not delivered on their promises. I don't want to name any particular issue as there are many. We have issues for every day in Parliament," O'Brien said told media. The second part of Parliament's Budget Session begins today, with the opposition ready to corner the government on the issue of bank frauds. Meanwhile, Congress deputy leader in the Rajya Sabha Anand Sharma has given a notice for a discussion under rule 267 of the House on the issue. His party is also likely to raise the issue of government formation in Meghalaya, where the Grand Old Party emerged as the single-largest party, but the BJP managed to ally with regional heavyweights with just two seats of its own. The BJP, meanwhile, is likely to counter the attack with the allegations against Karti Chidambaram, the son for former finance minister P Chidambaram in connection with INX media case.